My wife and I made our monthly trip to Costco yesterday morning and, since we didn't have to worry about buying school lunch items, had a little extra wiggle room in our budget to try some new things. This happened to be one of the items that ended up in our shopping cart. I made this purchase primarily for my oldest daughter, who isn't a big fresh fruit person but will snack on dried fruit when it is put in front of her. At first, the $9.99 price for this bag was a little bit of a turnoff and I had to think it over for a minute or so. Then, realizing I usually pend about $3 on a much-smaller bag that lasts her one sitting, I decided it was a good deal. And, after trying them last night, I have to say I don't regret the purchase. I usually have two major concerns when it comes to dried fruit products like this one. The first is the flavor. While most claim not to add sugar, I've purchased more than my fair share of dried fruit that was way too sweet to be natural. That was not the case with this brand. 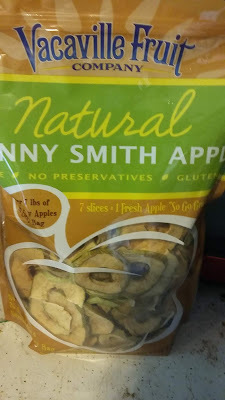 When I had my 7 slices (the equivalent, at least according to the bag, of one apple), I tasted the natural apple flavor and nothing that made me think it was tampered with. My other typical problem with dried fruit is the texture. I've had some that was crunchy to the point it hurt my teeth and others that were very chewy. This brand fell nicely in-between those two extremes. The apple slices were crisp without being hard. My daughter seemed to share my opinion of them. I offered her a couple slices yesterday evening and she was immediately in the bag for one more. All I can hope is she will listen to me when I tell her not to try to eat this entire bag in one sitting. Final Opinion: This was a decent product at a fair price. I would recommend purchasing it if you get a chance.